Discussion in 'iPhone and iPad Games' started by FrozenPepper, Jul 24, 2016. 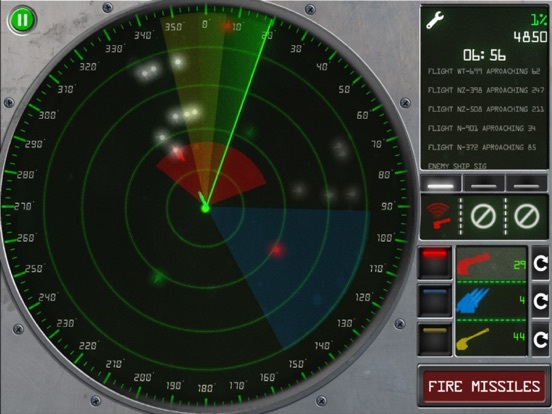 Take control of the airspace with Radar Commander ! Manage your weapons and protect your radar site from waves of enemies. Compete on the global leaderboards with other commanders. Immerse yourself thanks to highly polished GUI and very detailed soundscape. 3 Main weapons : - CIWS (Red shape): highly effective close range automatic defence system. Simply orient it, and it will automatically shoot downs enemies and missiles. 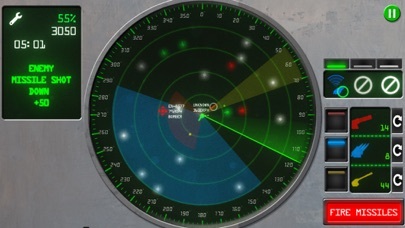 - Missiles (Blue shape): lock up to 3 targets and engage them with advanced long range missiles. - Artillery (Yellow shape): double tap to fire high powered artillery shells that inflict a wide area damage. Supply planes will drop strategically important power-ups, manage them and use them when essential. Fully supports multitouch for extreme weapon management. On iPad try with a friend sharing the weapons to control. No in-app purchases or banner / video ads, purchase once and have the full game ! 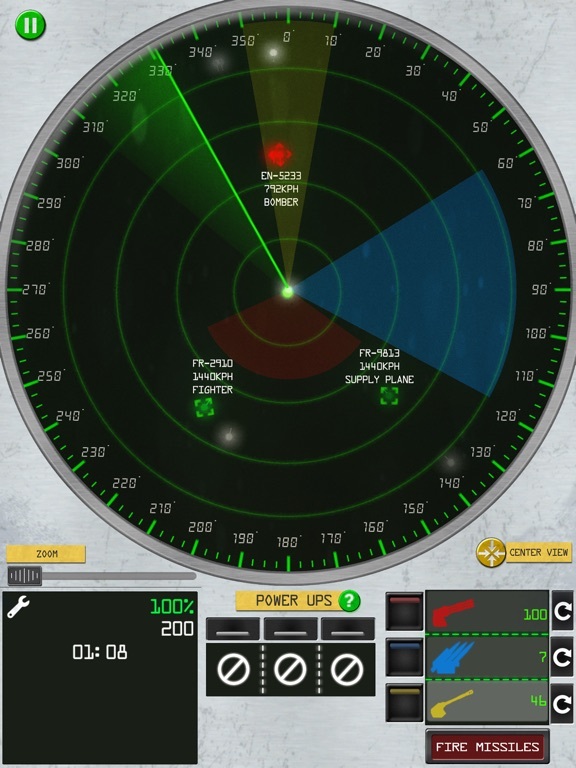 happy to write that "Radar Commander" has just been released on the AppStore. With it we tried to blend ATC games, Tower Defence and a pinch of good old Missile Command. 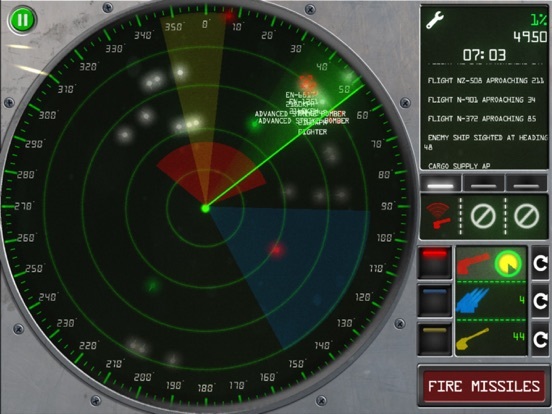 Radar Commander is actually just a small piece of a larger game, but will talk about that in the future. Hope you'll enjoy it, and as usual all feedback , suggestion and ideas are more than welcomed ! Great thanks in advance for your time. I'm doing the tutorial. The second mission with the massive attack. I cannot seem to activate the blue missiles I cannot get them to work at all. Also for the first update I think you need to make it so that ads do not start until the first few launches of the game. I got a full screen ad before I even started playing the first tutorial. This is going to turn a lot of people off getting a full screen ad before you can even play the first game or tutorial. Great thanks for the feedback ! Already working on first update and will surely implement your feedback. About the blue missiles, you need to have a "tracked" target (tap on it) inside the blue shape, you can have up to 3 tracked targets. 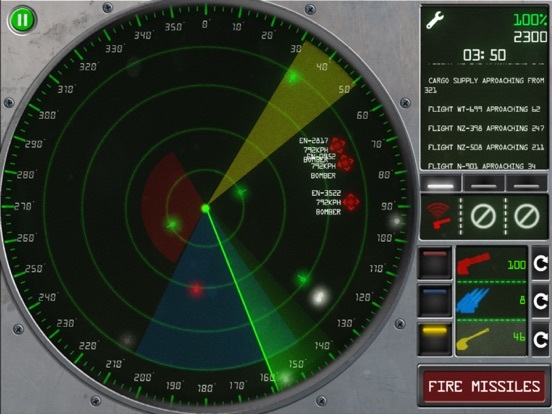 Press "Shoot Missiles" to fire at tracked targets in range. That's what I'm saying I can't get the blue shape to activate. I keep trying. It's just no go no matter what I do. I got the red and yellow no problem. I'm going to pay to remove the ads because I want to see where this goes. I like it. I'm just trying to figure out the blue missile issue. Sorry had edited my first reply. 2nd mission has missiles disabled so to force you to focus on CIWS and Artillery, hope it makes sense. Hahahahahaa man that's funny. I didn't know. Ok thanks. I'll report back after I've given the game a few hours and can give a full review. It's a very intense experience so far. So no more ads . I paid. Another quick issue for the first update. I'm still playing the tutorial. That second one really is brutal. I'm NOT saying this is bad. I really like this games entire premise AND atmosphere. However. One huge issue I'm having repeatedly is on my iPhone 6 tapping the super tiny white or red contact dots is very difficult with my big man fingers. So in the first update can you place a toggle in settings to enlarge the contacts a bit to make it a bit easier for people like myself? About iPhone 6 gameplay and sizes : Will definitely try your suggestion, one other problem we will have is targets overlapping when nearby, causing some conflicts on which one to select (which will get worst with bigger targets to select). We had experimented in various ways but none was satisfying. Will dedicate more time to it and hopefully find an elegant solution. Keep the ideas coming ! So I completed the tutorial. I played Survival. I played for about 1.5 hours to give the game a good and thorough play through. As I said previously the game is absolutely worth the $1.99 to remove the ads. There are no other costs. You get a fully premium experience after this single purchase. Now to the game. You play a radar operator / weapons officer in some war torn area. You will find enemy fighters and bombers coming in from every direction to take out your base. There will be civilian traffic, friendly fighters who will engage enemy planes, and friendly supply planes that bring you power ups. The game provides a constant, nail biting, intense experience! It's effing awesome! You must tap each contact to identify them and then you'll know if you need to engage them. You have 3 types of weapons. A short range automatically firing chain gun system that takes out enemy missiles and planes close in. Then you have a long range, but slower to move and target artillery system that makes a wide area of damage. You just have to be careful not to blow up friendly or civilian traffic. And then you have the quicker to move and target missile system where you can target 3 individual targets and fire 3 missiles at a time. Again be careful not to blow up civilian or friendly traffic. Lol I keep accidentally killing civilians. Then you have 3 power ups that increase the powers and width of your 3 main weapons. They are dropped off randomly by friendly planes while playing. As I said the game gets really intense. Sometimes enemies will make hit and runs in packs. Zip in and out. There are cool voice overs that give the game an awesome atmosphere. You really have to manage all of your weapons and their direction and how they work and how fast they fire. 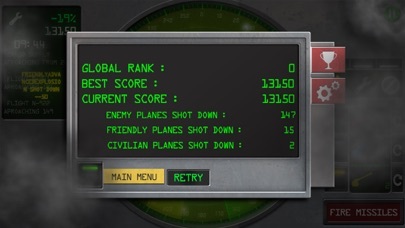 As I said I've blown civilians out of the skies with missiles and artillery lol. You accumulate points for every enemy you shoot down and lose a ton of points for every friendly you shoot down. I love watching friendly fighters launch missiles at enemy bombers. I think that was a nice touch. All in all its a unique game with a great premise and atmosphere with intense action oriented gameplay. The interface works. Once you pay the one price it's fully premium. My only complaint is that the dots are too tiny. I'd like a toggle in options to make the contacts just a little bigger. I've accidentally killed civilians with missiles during frantic attacks because I accidentally tapped the wrong contact repeatedly. This needs to be addressed. Another suggestion would be not having the artillery double tap to fire. I've been accidentally firing it. Why can't we use the same fire button that the missiles use? Why was it even set up like it is? Could you maybe give us the option? Thank you devs for a fun game with a premium experience. I can't believe you've already updated the game and incorporated my feedback. I don't even know how you did that in 1 day lol. That's just effing awesome. You are the type of people I like giving my money to. Do you have any other plans for the game? Are you working on other projects? If you are you need to include me in any betas. I've submitted a 5 star review on the AppStore under this same name which will appear by tomorrow. You know how Apple works. You might consider turning down the difficulty on the tutorial a bit. I died in the 3rd part, and a tutorial should really be kind of relaxed so you can learn. I actually completely missed the part about how to fire artillery in section 2, likely because I was too busy targeting and so forth and the instructions of kind of a blur. I will probably give it another go but I can definitely see this being a better experience with a larger screen. Wow, great great thanks for taking the time to write such a nice and detailed review. I'm very happy you are enjoying the game. About the Artillery double tap, we have experimented various ways and unfortunately a simple button would not work as you also have to define where to shoot. Another thing we have thought of was to have the double tap to define the shooting position where a cross-air would appear then press a button to actually shoot. But we thought it would make things more complex than they are now. About mission 2 of tutorial, I'm working on another update which will probably add another mission making the learning curve a bit more "gentle" (and options to increase radar items size is coming too ). Huge thanks to all for the feedback and hope to have news about next update very soon. 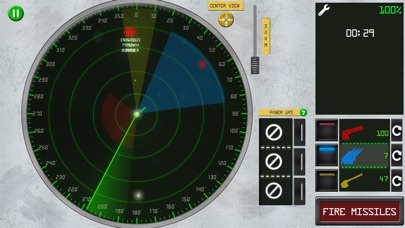 Happy to write that if everything goes well new update of Radar Commander should be available in a few hours ! - Easier / smoother mission 2 of tutorial. - New customisable setting options to change radar item size on all iPhone models. Great thanks again for the feedback and suggestions. Version 1.02 of Radar Commander is available on the AppStore bringing mainly fixes and improvements suggested by TouchArcade users ! I want nukes. make it happen. I'll pay. Lol. What about allowing us to reroute friendly fighters to targets? Have you considered adding that type of element? have to check exactly after which wave can spawn, but nukes are already in game under the form of nuclear shells for the artillery, you will receive it via para-drop randomly after a certain wave number (I think 6). Like very much the idea of rerouting fighters to target, we have discussed about it but in the end it remained out of initial release. We where scared of complicating it too much, but it might be worth a try. You mean routing a strike package to a time critical target? I'd *love* to see other elements of a Weapons Director/Air Batlle Manager's job. 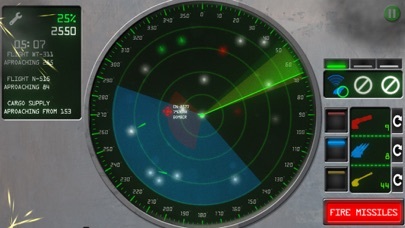 And in an advanced level I'd love to see an active EW environment, requiring adjustment of the radar or some such. Great thanks for the suggestions. Can't yet say much, but working on a separate title with much more depth. 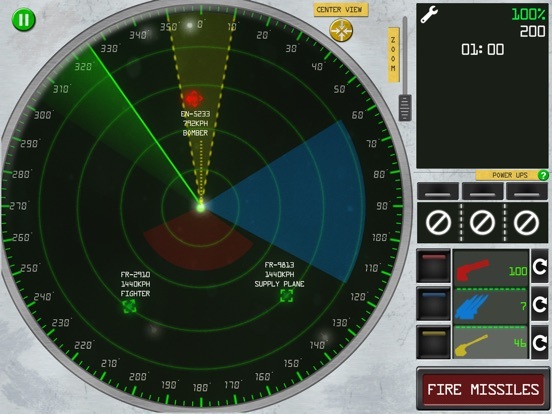 Radar Commander was actually born from a small part of this other project I can't yet speak of, we found it fun on it's own and quite fit for a "care-less and fast" mobile match so the "simple" Radar Commander was born and we tried to keep it as simple as possible. Hope to have soon a thread in the upcoming section about new project. 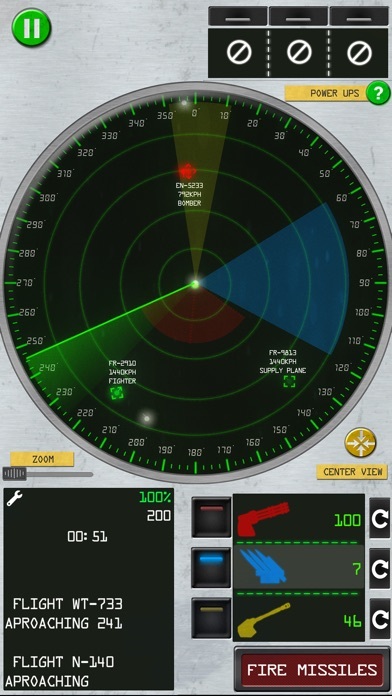 By the way, now RadarCommander is a paid app with no ads, probably being quite of niche game and us having close to no marketing budget , we where receiving too little downloads to justify ads, so we are now trying with a full "premium" model for it. PLEASE post the codes you have used so to warn other users. Great thanks for past and future feedback, suggestions and comments about the game.